On Tuesday March 12 2019, Softinn Solutions was invited to participate in the Biznet SME 2019 event at Casa Bonita Hotel, Melaka. This event is aimed to expand the business of small and medium enterprises (SMEs) in Malaysia. With the theme “Be Different. Go Digital “, it was a one-day event targeting the local SMEs from start-up to mass business level as well as aspiring entrepreneurs who have a passion to succeed in the business arena. During the event, there were talks and sharing session by business icons and coaches including our very own, JeeShen Lee, founder of Softinn Solutions and Raeesa Sya, founder of Orkid Cosmetics. In addition, the participants had hands-on experience on business setting with BizOn Breakout Session by Mohd Haniza, Branch Manager of CGC, Director of Matrade, Zuaziezie Zulkefli, Director of Matrade also representatives from SSM and TM. SME Biznet 2019 is a nationwide tour, and Melaka was the 3rd location after its stop in MaGIC Cyberjaya, which was held on 26 February 2019. 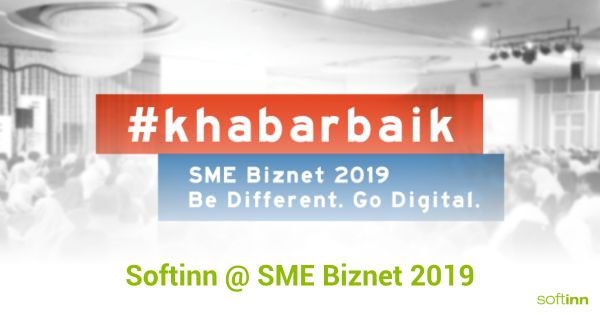 SME Biznet 2019 is an avenue to showcase TM’s latest business solutions to fulfil SMEs requirement, besides providing the delegates with a chance to learn and share from successful entrepreneurs who have utilised the digital way of doing business throughout their journey and success stories. For other digital entrepreneurs that missed the chance to participate in the SME Biznet 2019 in Melaka, join the upcoming SME Biznet held at Millésimé Hotel Johor Bahru, Johor.